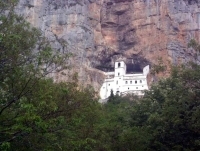 The Monastery of Ostrog, the Serbian Orthodox Church, dedicated to Saint Basil of Ostrog, is the most-visited pilgrimage destination in Montenegro. Thousands of devotees travel here every year to pray by the remains of Saint Basil for good health and alleviation of their suffering. However, the Ostrog Monastery also happens to be a massively popular tourist attraction in Montenegro, drawing day-trippers to gape at its truly remarkable construction, and to savour the unforgettable views of the Bjelopavlici Plains that it affords from its balconies. Set within the huge rocks of Ostroska Greda, the monastery has a nearly vertical backdrop of sheer cliffs. The Ostrog Monastery is said to have been constructed in this way to fill approaching pilgrims with a sense of God's grace, but even non-religious visitors are sure to be spellbound by its unique beauty.